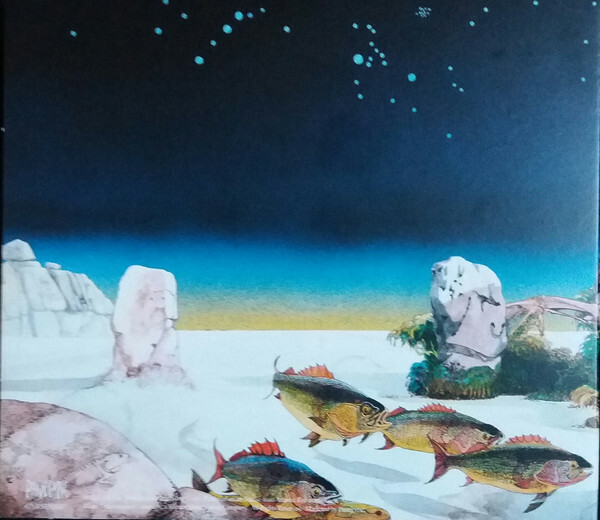 YES-TALES FROM TOPOGRAPHIC OCEANS-DELUXE EDITION BOX SET. After a three month break, Yes’ 1972-1973 Close To The Edge Tour was due to resume on the 8th of March 1973. This was the fifth leg in what had been a gruelling world tour. The new lineup of Yes had criss-crossed the world, playing North America and then Europe. Then after a three day break between 12th and 15th of September 1972, Yes returned to North America. They played thirty-nine dates between the 15th of September and the 20th November 1972. After that, Yes had twenty-five days of rest and recuperation. Then the tour resumed again. The fourth leg of Yes’ 1972-1973 Close To The Edge Tour fourth leg featured three dates in Europe. They took place in Manchester and London between the 15th and 17th of December 1972. After that, Yes had nearly three months off. After a well deserved rest, Yes headed out on the Japanese leg of the 1972-1973 Close To The Edge Tour. It consisted of just six dates. The first three concerts were due to take place in Tokyo between the 8th and 10th of March 1973, with Yes taking to the stage at three different venues. So between the 8th and 10th of March 1973, Tokyo became a home away from home for Yes. It was during that time in Tokyo, that Jon Anderson’s thoughts turned to the band’s next album. He was looking for a theme that would run through their sixth album. One of the ideas that he was contemplating was a large scale composition. Especially after he came across a footnote in the book he was reading, Paramahansa Yogananda’s Autobiography Of A Yogi. It was when Jon Anderson came to page eighty-three of the tome, that he came across the a lengthy footnote. This described four bodies of Hindu texts, which collectively, were known as shastras. Soon, Jon Anderson was fascinated by what discovered were compressive treatises. They dealt with all aspect of religious and social life, plus subjects like law, medicine, architecture and art. Jon Anderson read how each shastra conveyed: “profound truths under a veil of detailed symbolism.” Having read about the four shastras, Jon Anderson began to contemplate a four part album based on the four shastras. As the Japanese leg of the 1972-1973 Close To The Edge Tour continued, Jon Anderson continued to contemplate his idea for Yes’ sixth album. However, he wasn’t quite ready to discuss the idea with other band members. He needed time to think and work on the idea. By the 14th of March 1973, the Japanese leg of the 1972-1973 Close To The Edge Tour was over. Next stop was Oceanic leg of the tour. Yes would play five concerts in Australia between the 17th and 26th of March 1973. After that, Yes returned to North America for the third time, on what was the seventh leg of the tour. Yes were booked to play eighteen dates in North America between the 4th and 22nd April 1973. It was during that leg of the tour that Jon Anderson approached songwriter and arranger Steve Howe about a four part album based on the four shastras. Straight away, he was interested in the idea. Soon, Jon Anderson and Steve Howe were spending their spare time working on the idea. After shows, they had candlelight songwriting sessions, where the two friends worked on ideas and motifs that fitted in with the album’s theme. Sometimes, it was trial and error, with someone playing a riff and the other rejecting it. Occasionally, an idea that had been rejected would later, be reused. That was the case with a guitar riff that later became part of The Ancient. Slowly, Jon Anderson and Steve Howe were making progress. Things changed when Yes arrived in Savannah, Georgia on 20th April 1973. Yes played what was the sixteenth of eighteen concerts in the North American leg of the tour. It was the seventh and final leg of what had been an epic and successful tour. After the show in Savannah, Jon Anderson and Steve Howe retired to a hotel room for another songwriting session at 1am. This time, everything fell into place. The next morning, Jon Anderson and Steve Howe were still elated and feeling exhilarated from the success of their marathon songwriting session. They had completed writing and planning what would be their sixth album in just six hours. This they couldn’t wait to share with the rest of Yes. However, when Jon Anderson and Steve Howe told the other members of Yes about their plan for a double concept album that featured just four lengthy tracks, not everyone share their enthusiasm. The other members of Yes were going to take some convincing about the merits of the double concept album. Still though, Jon Anderson and Steve Howe were elated by what had been a truly magical night. Neither man had enjoyed such a fruitful songwriting session, and for the next few days felt ten feet tall. By then, Yes had completed their 1972-1973 Close To The Edge Tour. Nearly nine months after the 1972-1973 Close To The Edge Tour began, it ended on 22nd April 1973. This wasn’t meant to be the final tour date, Instead, the tour was meant to end in Acapulco, Mexico on the 1st of May 1973. Alas, the concert was cancelled and Yes arrived home early. Given the 1972-1973 Close To The Edge Tour had been a gruelling tour, the members of Yes were desperately needing some time off. Not for long though. Yes had an album to rehearse and record. Refreshed after their break, the members of Yes reconvened at Emerson, Lake and Palmer’s Manticore Studios in Fulham, London. For one member of Yes, they were about to make their debut on a Yes album. This was Alan White, who had replaced Bill Bruford, who had resigned just before the 1972-1973 Close To The Edge Tour began. Having played on the tour, Alan White was now preparing to make his recording debut with Yes. As the rehearsals began, Yes practised and honed the material. There were some dissenting voices about the material Jon Anderson and Steve Howe had written. Bassist Chris Squire was worried. He realised that there was: “a lot of substance” to the four tracks, but worried that sometimes, album was too eclectic. Keyboardist Rick Wakeman was worried by the move towards avant-garde and fusion. He was wondering if he anything to contribute to the album? It seemed not all the members of Yes shared Steve Howe and Jon Anderson’s enthusiasm for the album. After a month of rehearsing, Jon Anderson decided to head to Marrakesh with his wife for short holiday. During his stay, he honed the lyrics for the forthcoming album. Meanwhile, back in London, Chris Squire spent sixteen or seventeen hours in the studio each day on pre-production. When Jon Anderson returned home, the lyrics had taken shape. Things were looking up form Yes. Behind the scenes, things were very different. There had been arguments about where to record the album. Rick Wakeman and Jon Anderson wanted to record in the countryside. Jon Anderson took this further. He envisaged recording the album in a forest during the night. This was quickly vetoed. Steve Howe and Chris Squire wanted to record the album in London. New recruit Alan White decided discretion was the better part of valour, never voiced a preference. It was stalemate. Meanwhile, engineer and co-producer was Eddy Offord was trying to convince Yes’ manager Brian Lane to record the album in the countryside. This he hoped, might reduce the tension and bad feeling the album had caused within the band. Alas, it was to no avail. Eventually, Steve Howe and Chris Squire won the day. Brian Lane decided the album should be recorded in a London. The city had many top studios. One of the best, was Morgan Studios, London. It was equipped with some of the most advanced recording equipment, This included a twenty-four track Ampex reel-to-reel recorder. For a band about to record an ambitious and complex album, this was perfect. Morgan Studios was the perfect studio for Yes. Yes arrived at Morgan Studios, in late summer of 1973. This time round, their rhythm section featured drummer and percussionist Alan White, bassist Chris Squire and guitarist Steve Howe. Keyboardist Rick Wakeman joined lead guitarist and vocalist Jon Anderson. He was augmented by backing vocals from the rest of Yes. They were about to co-produced one of the most ambitious albums of their career with Eddy Offord. Before that, Jon Anderson and Yes’ manager Brian Lane decided to decorate the studio. Once Yes had settled into Morgan Studios, Jon Anderson and Brian Lane decided to decorate the studio like a farmyard. Jon Anderson stuck pictures of farmyard animals to the wall and put plant and flowers around the studio. A picket fence was even added, and at one point, keyboards and amplifiers rested on a bales of hay. This seemed to unite the once divided band. Now Yes could begin work on what was a complex and ambitious double concept album. The four tracks, The Revealing Science Of God (Dance Of The Dawn), The Remembering (High The Memory), The Ancient (Giants Under the Sun) and Ritual (Nous Sommes Du Soleil) ranged between eighteen and twenty-two minutes. Given the length and complexity of the four tracks, recording took five months. During that period, keyboardist became disenchanted with the way Yes’ music was heading. Granted Yes continued further down the road marked progressive rock, but added elements of avant-garde, folk-rock, jazz and psychedelia. During the four lengthy suites, Yes take the listener on a captivating adventure across complex, multilayered, genre-melting musical landscapes which feature a myriad of Eastern themes and sounds. The music is cerebral, ruminative and sometimes, atmospheric, beautiful and dramatic as the arrangements ebb and flow. Seamlessly, there’s changes in time signature as the one part of the suite gives way to the next. Constantly, nuances, subtitles and surprises unfold as the rich musical landscape changes. Alas, for Rick Wakeman, these changes were too much to take. His fears came to fruition. Before the recording began, Rick Wakeman felt he had nothing to contribute. Despite this, he arrived each day and recorded his keyboard parts. For the rest of the time, Rick Wakeman headed to Morgan Studios’ bar, where passed the time drinking and playing darts. Gradually, his disenchantment grew. Fortunately, Black Sabbath were recording Sabbath Bloody Sabbath in the other studio. Rick Wakeman began to spend time with Black Sabbath. Later, they were looking for someone to play a Minimoog part on the track Sabbra Cadabra. Rick Wakeman was happy to help out and headed to studio. Soon, he had recorded his part. Given he was helping friends, Rick Wakeman wouldn’t accept payment for playing on Sabbra Cadabra. So Black Sabbath decided to pay him in beer. It was one of the lighter moments of the recording session. Midway through the recording Yes’ new album, all the plants had died and the picket fence and pictures had been covered in graffiti. The studio started to resemble a barn. This didn’t bother Yes. They embrace the organic nature of the surroundings. Everything was going to plan. Apart from Jon Anderson’s request to create a bathroom sound effect on his vocals. Yes’ lightning engineer tried to build a wooden box which was then tilled. Soon, the tiles started to fall off the box. It failed to recreate the requested bathroom sound. That was a minor blip, as the album took shape. Eventually, after five months, the unnamed album was complete. However, very nearly, Yes’ five months of hard was almost lost. With the album complete, Eddie Offord began mixing the album. He was within a couple of days of completing the album. However, after spending much of the night mixing the album, Eddie Offord and Jon Anderson headed home. As Eddie Offord left the studio with the master tapes, he was frantically searching his pockets for his car keys. When Eddie Offord reached his car, he sat the tapes on the car roof. Having found his keys, Eddie Offord drove off forgetting the tapes were still on the roof. Meanwhile, a horrified Jon Anderson looked on. By the time he caught up with Eddie Offord, the tapes had fallen off the roof. When Jon Anderson saw them lying on the road, he managed to stop a bus just before it ran over the tapes. Disaster was diverted. When mixing of the album was complete, Yes took the album to their record label Atlantic Records. By then, Jon Anderson was contemplating calling the album Tales From Tobographic Oceans. Tobographic was a word than Jon Anderson claimed to have invented. However, Jon Anderson’s plans changed after he had dinner Atlantic Records’ Nesuhi Ertegun. He pointed out Tales From Tobographic Oceans sounded similar to Tales From Topographic Oceans. When this was pointed out to Jon Anderson, he decided that was a much better title for Yes’ sixth album. Meanwhile, work began on the album cover. Roger Dean who had designed and illustrated previous Yes album covers was brought onboard. He surpassed his previous efforts with a classic and iconic album cover. The inspiration for the cover came from a conversation Jon Anderson and Roger Dean during a flight from London to Tokyo via Anchorage in 1973. Jon Anderson had told Roger Dean about a book he had reading which featured pictures of landscapes. With this conversation in mind, Roger Dean designed one of the greatest album covers of his career. Tales From Topographic Oceans was almost ready for release. 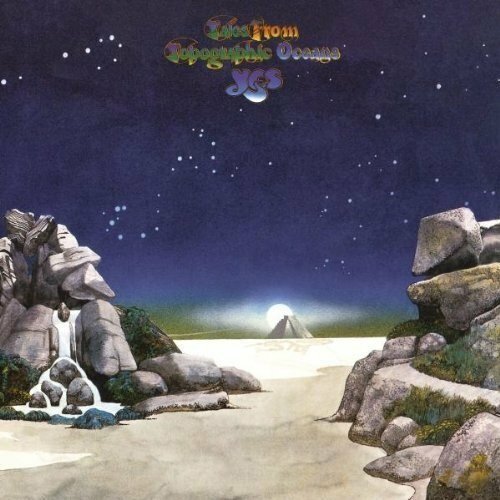 Before that, critics had their say on Yes’ much-anticipated sixth album, Tales From Topographic Oceans. Yes who were one of the most successful progressive rock bands, had established a reputation for producing ambitious, complex albums of multi-layered, genre-melting music. Tales From Topographic Oceans was no different. However, what was different was that it was a double concept album that was inspired by the footnotes on page eighty-three of Paramahansa Yogananda’s Autobiography Of A Yogi. It detailed the four bodies of Hindu texts, which collectively, were known as shastras. They were compressive treatises that dealt with all aspect of religious and social life, plus subjects like law, medicine, architecture and art. Each of the four shastras inspired one of the lengthy suites on Tales From Topographic Oceans. This was very different album from the majority of the music that critics had heard during 1973. When the critics heard Tales From Topographic Oceans, the reviews were mixed. Some critics didn’t seem to “get” Tales From Topographic Oceans. Words like beautiful, brilliant and sublime were used. Alas, so were disappointing, repetitive and self-indulgent. A few critics thought that album was way ahead of its time, and its importance would only be recognised later. They would be proved correct, and over the next forty-two years, history would be rewritten. Meanwhile, the jury was out on Tales From Topographic Oceans. Record buyers had the final say. Tales From Topographic Oceans was due to be released on 7th December 1973. As the released day drew nearer, record burrs pre-ordered copies of Tales From Topographic Oceans on both sides of the Atlantic. So many copies were pre-ordered in the UK, that Tales From Topographic Oceans was certified gold before its release. When Tales From Topographic Oceans was released, it reached number one in the UK for two weeks. In America, the Tales From Topographic Oceans reached number six and was certified gold. Elsewhere, the album reached number four in Canada; nine in Japan and eight in Holland, Sweden and Norway. Against the odds, Tales From Topographic Oceans had been a commercial success. Alas, it came at a cost. After the release of Tales From Topographic Oceans, Yes embarked upon another lengthy tour. When they returned home, a disenchanted Rick Wakeman left Yes. However, his swan-song was what’s now regarded as one of the greatest albums of the progressive rock era, Tales From Topographic Oceans. It’s a classic album, that as a few critics forecast would only be appreciated later. That proved to be case, and is why recently Tales From Topographic Oceans was released as a box set by Panegyric. The Deluxe Edition is no ordinary box set. Instead, it features two CDs and two DVDs. Discs one and two features Steven Wilson’s 2016 mix of Tales From Topographic Oceans. This is quite different from the original mix. Steven Wilson appears to have taken great care with the remastered remix. It’s certainly not over loud and has a punchiness. The remix seems slightly larger and wider. There’s also a slightly more open sound and the remix also benefits from a greater degree of separation. Some of the instruments sound much clearer. However, this remix won’t suit everyone. There will be purists that say a classic album should never be remixed. Probably, the best way to look at remixed albums as something to augment, not replace the original album. Disc two also features an extended version of Dance Of The Dawn and single edits of each track from Tales From Topographic Oceans. Indeed, there’s two separate single edits of Ritual included. This will please collections. This leaves just DVD One and Two. They feature Tales From Topographic Oceans mixed in 5.1 Lossless Surround and extra track mixed from original multi-track sources. There’s also the new 2016 Album mix and a flat transfer of the original version of Tales From Topographic Oceans. Both mixes are in high resolution stereo. As an added bonus, there’s alternate version of Tales From Topographic Oceans, single edits and exclusive audio extras. Quite simply, this is one of the most comprehensive releases of Tales From Topographic Oceans. The reissue of Tales From Topographic Oceans is a reminder of a true classic album.Tales From Topographic Oceans was a groundbreaking album that was way of ahead of its time. It was only later that people began to understand and cherish what was a ambitious, complex and innovative album. Yes took as their starting point progressive rock, but added elements of avant-garde, folk-rock, jazz and psychedelia. This was the start of what was a captivating musical adventure. It comprises four lengthy suites that are complex and multilayered. Genres melt into one during these musical soundscapes. They feature a myriad of Eastern themes and sounds. The music is cerebral, ruminative and sometimes, atmospheric, beautiful and dramatic as the arrangements ebb and flow. Seamlessly, there’s changes in time signature as the one part of the suite gives way to the next. Constantly, nuances, subtitles and surprises unfold as the rich musical landscape changes, and a classic album unfolds. That classic album is Yes’ sixth album Tales From Topographic Oceans, which was released on December 7th 1973. Just over forty-three years later, Tales From Topographic Oceans is a timeless classic that’s testament to the vision and imagination of Jon Anderson and also Steve Howe. Originally, it was Jon Anderson that came up with the concept of Tales From Topographic Oceans. Steve Howe came onboard at the planning stage and the with help of the other members of Yes, recorded what was a groundbreaking, timeless classic Tales From Topographic Oceans. ← ELECTRIC LIGHT ORCHESTRA THE STUDIO ALBUMS 1973-1977.